In the crossover market, there are plenty of vehicle models that all demand your full attention as they pass, each of them with stellar exterior styling and the promise of grandeur both under the hood and throughout the cabin. However, throughout the years, only one has been able to separate itself from the rest of the pack. We're talking about the Volkswagen Tiguan, which returns to Longview TX for the 2018 model year bigger and better than ever before. Better yet, it's currently available right here at Gorman McCracken Volkswagen! Our sales team is determined to bring you a car buying experience that is second to none, so we've done some research on the 2018 Tiguan and its features. Come with us today and see all that it brings to the table for you and your family! The all-new Tiguan has been engineered with your continued enjoyment in mind. It features a turbocharged Inline 4 engine capable of producing up to 184 horsepower, and 4MOTION® All-Wheel Drive mixes with an 8-speed automatic transmission to keep your drive smooth, responsive and fun! Luxury, connectivity and interior beauty all come standard on the 2018 Tiguan; as the Volkswagen Digital Cockpit brings the details of your drive to life, keep yourself connected with Apple CarPlay and Android Auto. Also, you can play all your favorite songs through a top-quality Fender® Premium Audio System! A longer and wider design leads the Tiguan to be even more versatile for you. You'll be treated to up to 73.5 cubic feet of storage (a 30% increase from years past) and V-Tex leatherette seating ensures your comfort through any situation. As you drive, gaze out of the panoramic sunroof for a clearer look at the world! 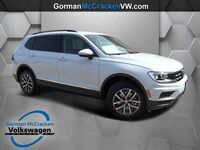 If you're interested in checking out even more of what the 2018 Tiguan is capable of, feel free to contact our sales team here at Gorman McCracken Volkswagen. We'll get you behind the wheel for a test drive and help you work out a financing deal if you're convinced that it's right for your needs. Stop and see us today!